Dutch artist Otto Egberts started his career in the 1980’s. His subject is the individual that stands alone in an enstranged sub-realism expressed through painting, drawing and installations. In 2012 he started an in Dutch written blog criticizing various elites in society and predicting the downfall of the Occident. 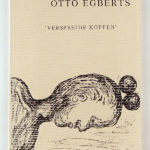 In “Verspreide Koppen” each page on the right depicts a head dramatically tormented by strange objects and geometrical forms.